Containing an exciting new functionality for Request for Quote an Rework, the Tricorn:Production 8.1 is being showcased by Tricorn Systems at Southern Manufacturing 2019. 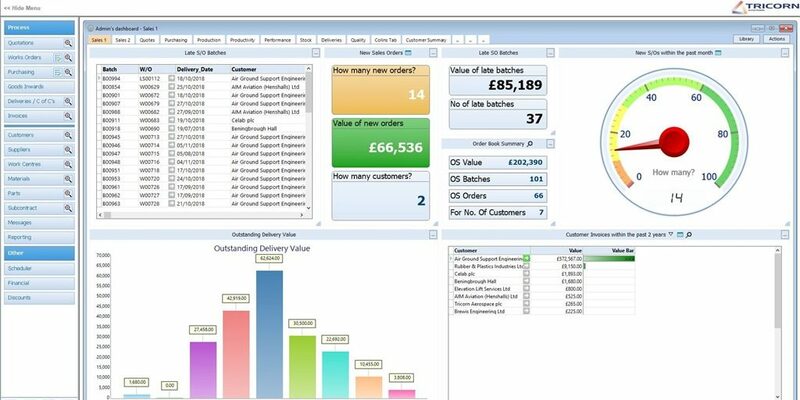 This latest release also has many customer-requested enhancements such as Sell from Stock and Counter-Sales, parts-selling price breaks, part version history and up-issue and fast delivery and invoice. Tricorn:SFDC-e (shop floor data capture) has also been significantly enhanced to provide inspection booking, operation gates (preventing successor operations being started until the predecessor op has been successfully completed), and to fast track jobs. There are also demonstrations of the Tricorn:Dashboard and introducing Tricorn:Dashboard Cloud, where key performance charts and manufacturing status information is available via any browser – on a PC, tablet or smartphone – with data extracted from the Tricorn database. The role-based module provides key information relevant to a user’s responsibilities without having to run reports or export data to Excel to analyse. Each Dashboard widget can be a task list, chart or alert/warning notification that updates on a frequency defined by the user. The library currently contains over 80 standard manufacturing-based widgets.